as soon as he got here for a short visit, it was time to fish. It just got better and the fish got bigger. And then he caught this prehistoric fish. and he takes this nice buck. What a afternoon for a Grandson! Times were much slower and laid back in the early days of East Texas. Most every small town had a prankster who enjoyed the thrill of pulling off a good joke on someone. One of the very best was a man from Hemphill, Texas, Drayton B. Speights, who lived near the Palo Gaucho Creek. Drayton loved practical jokes. One time he had a man weld a quarter to the head of a nail. The quarter was then nailed to the floor of a store. He loved to watch people try to pick up that coin without success. The prank considered by most people to be his best practical joke ever, involved an Unidentified Flying Object. In 1949 people began seeing strange events in the skies and speculation about UFOs was in the forefront of conversations in most small towns. While discussing these mysterious objects with fellow croquet playing friends, Drayton got a bright idea. He would have a flying saucer made and would let the croquet players examine it. The plan was put into action. Milton Woods, a mechanic, helped fashion a “flying saucer” out of sheet metal. It was about five feet across, and looked about like a chicken brooder. They placed an electric motor inside along with old radio tubes and electrical wires. The final touch was a glass vial with a piece of paper inside it. A doctor’s wife in Hemphill was from Europe and had friends in Czechoslovakia. Speights was given a letter from her friends which was written in Czech or Slovak. This letter was rolled up and placed inside the vial and inserted into the UFO. The flying object was now ready. Tom Parker told Speights where the croquet players were meeting the next night. After dark he drove the UFO to the driveway entrance of the home. He placed the object on the private drive very near the main highway. It was a narrow lane and the saucer was wide enough that no one could drive around it. Speights waited in the bushes but no one ever came out, so he went home. Ray Dent discovered the object as he exited the driveway. He summoned the other players who were afraid to touch the UFO. They pushed the object into the ditch with shovels and called the sheriff. The sheriff hauled the UFO into town and placed it on the courthouse grounds. The next morning, the small town was abuzz – a flying saucer had been found in Sabine County. The word had spread. Newspaper and radio reporters from Shreveport and Beaumont were in town to view the object and send their stories out. Upon discovering the glass vial with the letter inside, it was decided that it should not be opened by hand because it might blow up or contaminate someone. So one fellow took the vial and threw it up against the courthouse wall. That way, if the thing exploded, all it would do was blow up the courthouse. They finally got the letter out but no one could read it. A local grocer had the sheriff carry the saucer to his store, where it stayed on display for several days. People would poke around it, examine the thing, and guess whether it was made in such a way that it would really fly. After a week or so, a local attorney who knew about other languages discovered that the letter was written in Czech and not in a mysterious language of another planet. That revealed the hoax at last. Speights said he never knew what happened to the saucer. Some years later Drayton had another opportunity for a prank. Word got out in Brookeland, Texas, a small community south of Hemphill, that a lion had escaped from a train carrying a circus, and was wandering about in the forest. He seized upon this opportunity by typing an official looking letterhead on onion skin paper “The Dallas County Zoo” a letter addressed to the mayor of Hemphill. The letter stated that the lion seen around Brookeland was no doubt the one that had escaped from the Dallas zoo. It was a female lion and most likely had two cubs and would therefore be extremely dangerous. The letter was ‘signed’ by Fritz Dobrinsky, director of the Dallas County Zoo. Drayton had an employee headed for Dallas mail the letter from Dallas back to Hemphill. People began seeing things and a couple of lion hunts were organized. An entire blackberry crop near Brookeland was lost because everybody was afraid to go out and pick them. Various people swore that they had seen the lion’s track and even heard it roar. A game warden finally debunked the lion scare by investigating and revealing that the Dallas County Zoo did not exist. Drayton was truly an expert when it came to practical jokes and pranks, a man after my own heart. In today’s litigious society I doubt that anyone could get away with pranks such as he was able to back then. They do make for a good story of days gone by. *Thanks to Bill Speights and Leon Hale for their contributions. An Air Canada plane leaves Pearson Airport under the control of a Jewish captain; his co-pilot is Chinese. not Chinese.’‘Japanese, Chinese, Vietnamese …doesn’t matter, you’re all alike!’There’s a few minutes of silence.’I no rike Jews!’ the co-pilot suddenly announces. a rabbit under a corn feeder. HEADED TO THE BIG DANCE: Albert Collins will look to fulfill a lifetime dream by fishing the Bassmaster Classic in Oklahoma in February. Photo by B.A.S.S. Albert Collins knew he had an advantage fishing his home waters of Sam Rayburn Reservoir on Nov. 7-10 at the Bassmaster Weekend Series National Championship. Collins was throwing crankbaits and soft plastics to fish he knew were there. Luckily, the fish cooperated and Collins won the tournament, earning his first-ever trip to the 2013 Bassmaster Classic at Grand Lake o’ the Cherokees in Oklahoma. 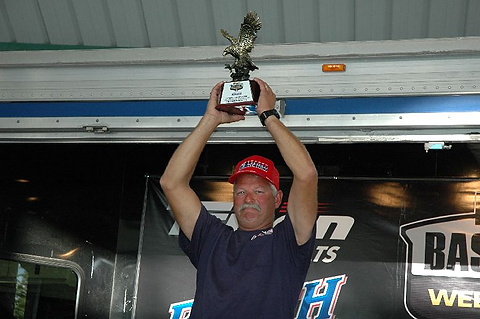 “I know (Rayburn) pretty well,” he said, “but I also had a really good tournament. The weights were a couple of pounds higher than I thought they would be. The tournament was still tough, but not as tough as the lake had been fishing. Covering a lot of water, Collins threw a deep-diving crankbait by 6th Sense Lures in threadfin shad pattern, alternating with a Zoom Ol’ Monster worm in plum apple color. Along with winning $100,000, Collins fulfilled his lifelong dream of competing against the bass anglers in the world at the Classic. Collins fishes a lot of the local Texas tournaments, including Bass Champs, the ABA Weekend Series and Bass-N-Bucks Tournament Trail. He has never fished Grand Lake o’ the Cherokees, but has been hitting the lake since after Thanksgiving. Collins was confident headed into the Classic, where he expects to do well. Collins will join the Texas contingent of Alton Jones, Todd Faircloth, Yusuke Miyazaki and Takahiro Omori at the Classic. The residents of Hemphill Care Center have enjoyed various holiday celebrations during the month of December. Our two annual Christmas parties were highlighted with a visit from Santa Claus who gave gifts to all of us. We say a big Thank You to our families and friends who made both parties special for their loved ones. We enjoyed the delicious treats provided by guests and staff. During the December 15th party our friends from Hemphill Church of Christ were named Volunteer of the Year for their faithfulness in sponsoring Bingo games and gospel singing. They also decorated our beautiful Christmas tree in the dining room. We congratulate Estella Tibbs who was named Resident of the Year 2012. Congratulations go to Patty Helmer and Bobbi Kukuk as Employees of the Month; Jack Winn as Resident of the Month; and Brother G as Volunteer of the Month. Our residents celebrating birthdays in December include Angie Martin, Bettie Mae McGraw, Larry Brown, Bobbie Garrett, Anna McKay, Jeanette Barlow, Lavella Simmons, Bill Smith, and Marie Perkins. We express our love and sympathy to the families of Ava Anderson, David Malone, Myra Carson, and Bernie Mae Simmons. Our thanks go to our December Bingo sponsors: April from Texas Home Health, Brother G from Heart to Heart Hospice, Parkway Baptist Church, American Legion Post #197, and Hemphill Church of Christ. We were blessed with Christmas worship services and singing provided by Hemphill First Baptist, Parkway Baptist, Fairdale Baptist, Community Fellowship Church, Bethel Chapel Baptist, Hemphill Church of Christ, Bethany Baptist, and Gravelhill Baptist Church. We also received a blessing from Bible study with Brandi from Harbor Hospice and Maria Lamb. Special appreciation goes to our friends from Six Mile Baptist Church for sponsoring our Christmas store and allowing us to have a free shopping spree. We had fun selecting gifts for our family and friends. We enjoyed a special visit from ventriloquist Eddie Sunday and his buddy Clifford. Another Christmas highlight was a December 16th Christmas Cantata by the Parkway Baptist Church Choir. We look forward to our New Year’s Eve pizza party. The residents of the Care Center say thank you to all who helped make the year 2012 a happy one for us. We say Thank You and Happy New Year! P.S. I, Mary Howell, want to express my personal appreciation to my sister Clara Murphy, and my friends Karen Underwood and Nici Miller, for their faithfulness in taking dictation and typing this column for me each week. I also want to thank Stephanie Corley and her staff for allowing me to publish my “On the Bright Side” column in the pages of the Sabine County Reporter. I express my appreciation to Freddie Keel who publishes “On the Bright Side” online at www.tadpolesoutdoorblog.com. I want to say thank you to all who read “On the Bright Side” every week. Celebrating the silver anniversary of TPWD’s Public Hunting Program. It’s 4 a.m. on a cool, drizzling November morning, and the line of people looks like a scene from a Black Friday sale. But these folks are checking in, not checking out. 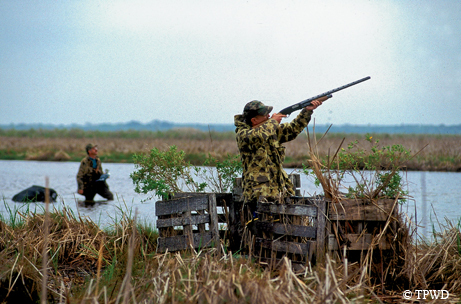 It’s the first week of duck hunting season, and this scene is being replicated at nearly a dozen public hunting areas along the Texas coast. Waterfowlers sign in and make their way into the marsh to set up decoy spreads for the morning hunt. For the price of dinner and a movie, these hunters will get the chance to experience some of the best duck hunting anywhere. For hunters who do not have access to privately owned land, the Texas Parks and Wildlife Department provides low-cost access to thousands of acres of department-managed lands for hunting, including most wildlife management areas, some state parks and many leased properties. Access to those properties is available to hunters who purchase an Annual Public Hunting (APH) permit. This hunting season, the TPWD Public Hunting Program recognizes 25 years of public hunting opportunities offered by the APH permit. Since 1987, more than 817,000 hunters have taken advantage of affordable access to public hunting land. With more than 95 percent of hunting land in Texas in private hands, the APH permit has been and will continue to be a valuable resource for people looking for access to the outdoors, whether for hunting, fishing, bird watching, hiking or photography. The APH permit costs $48 and is valid from Sept. 1 through Aug. 31 of the following year. It allows hunting on designated properties for a variety of species, including doves, squirrels, rabbits, white-tailed deer, feral hogs, turkeys, predators and furbearers, without having to pay a daily fee. Equipped with the appropriate Texas hunting licenses and stamps, permit holders may take kids under age 17 hunting for free on these areas. Just remember, a Texas hunting license and adult supervision are always required for youth participants. A new online map feature allows for “virtual scouting” of public hunting areas. You can follow links to detailed aerial maps, Google Earth imagery, APH permit information and maps found in the map booklet. Permits are conveniently available wherever hunting and fishing licenses are sold, online at www.tpwd.state.tx.us or by calling (800) TX-LIC-4U. There is a $5 convenience fee for online and phone purchases. If the permit is purchased at a TPWD office, the public hunting lands map book will be provided immediately at the time of purchase; otherwise, the publications will be mailed to the purchaser within two weeks. Teenagers growing up in East Texas during the 1940s and 1950s were accustomed to being surrounded by towering pine trees, and sturdy oaks. I was one of those kids being reared in about the deepest part of East Texas. In the pre-television days of the late 1940s, we kids had to invent our own activities to keep our minds occupied. Some of them were good, and some were not so good. Among the latter was climbing the metal fire tower located just west of San Augustine. The U.S. Forest Service built a fire lookout tower probably during the 1930s just off Highway 21 west on what is now CR280. The tower was located approximately 150 yards back in the woods. Of course it was a dangerous thing to do, but it was great fun and a daring feat to trespass on the property to climb up the tower as high as one’s nerves would allow. I recall a few females trying their climbing ability, but mostly it was the hairy-legged teen boys showing off for their dates. Another fire tower was located just south of Red Hills Lake in Sabine County on Highway 87. Whenever a group of teens made the trek to “Milam Lake” they usually capped off the swimming trip with a try at climbing that tower as well. I do not recall anyone falling or otherwise injuring themselves during this activity. A recent drive down CR280 shows no evidence that a fire tower ever existed, having been torn down years ago. That is a shame as these fire towers served a significant service to our country. The same is true of the tower that used to stand south of Red Hills Lake. The towers have an interesting background, having been built out of necessity. The obvious purpose of a fire tower was for a watchman to scan the forest for any sign of smoke indicating a forest fire. They were constructed of either wood, or steel, with a small 10’ by 10’ building on top of the tower. These towers gained popularity in early 1900s. Fires were originally reported by use of carrier pigeons. Later two-way radios were used, then telephones, or heliographs came into use as technology improved. By 1911 fire towers were being built on the top of mountains. In 1933, Franklin D. Roosevelt formed the “Civilian Conservation Corps” which put the men of our county to work building many things in our communities. The CCC built over 250 lookout towers between 1933 and 1942. So, the golden era of these towers was between 1930 and 1950. In 1942 an additional task was assigned to the watchmen in the towers. That was using trained enemy aircraft spotters, prompted by our entry into WWII. The use of and need for fire towers began to decrease and decline in the years between 1960 and 1990. Modern technology – aircraft, powerful radios, radar, and even satellites, made the towers outdated and of little use. Thus, they began to disappear from our forests one by one, unnoticed by most people. It is interesting to note that Idaho had the most towers, 987. Kansas was the only state that never had a fire tower. The tallest fire tower in the United States was the Woodworth Tower in Alexandria, La. at 175 feet. The highest tower in the world was the Fairview Peak near Gunnison, Colorado at 13,214 feet, which was actually on top of a mountain. In 1911 a U.S. Forest Service employee by the name of William B. Osborne, Jr. invented the “Osborne Firefinder”. This instrument measured the distance to and location of a fire by use of his invention. Improved versions of this device are still used in certain parts of the country to this day. So the two fire towers that we used to climb on no longer exist. They are just a memory, enhanced by a couple of snapshots in an album which prove their existence in a bygone era.